Dave and I have decorating ideas for fall that can give your porch and yard that inviting, wonderful homey feeling. When someone visits your home, the first thing that they will see is your front porch. 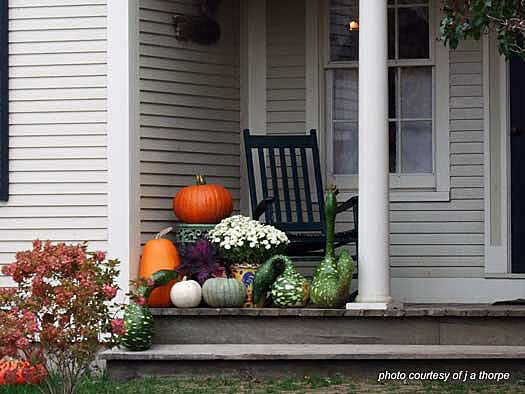 Autumn decorating gives your porch an inviting, welcoming feel for your family and friends. 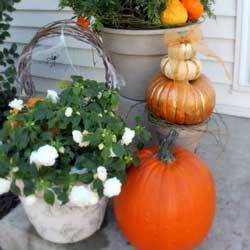 Our fall porch decorating ideas and pictures are sure to inspire you this season. Enjoy these front porch ideas for fall. Autumn is a season for color and simplicity as evidenced in the photo above. A few beautiful fall plants on the front porch steps welcome the season in all its splendor. Combining the elements of color, texture, and natural decorative items as in the photo above, creates a fun, colorful arrangement for the season. We'd be remiss if we didn't address front door wreaths as part of our decorating ideas for fall. Nothing says autumn quite like a front door wreath. Although you can choose a colorful wreath adorned with fall leaves, berries, and perhaps feathers, you might want to consider taking a more whimsical approach. 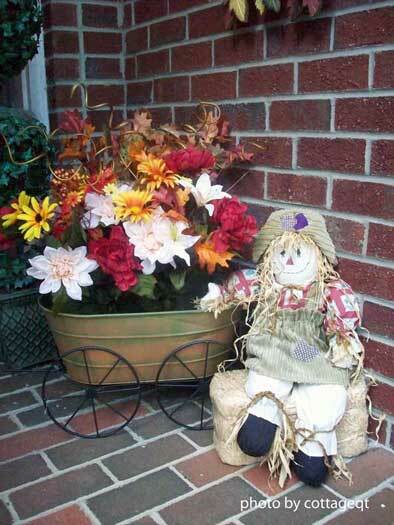 The scarecrow wreath above is fun and adds a heart-warming touch to any front porch. 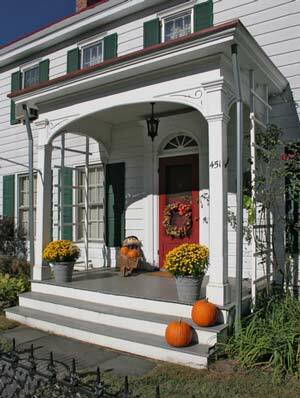 One of our favorite fall decorating ideas is to create a focal point on your porch like in the photo above. 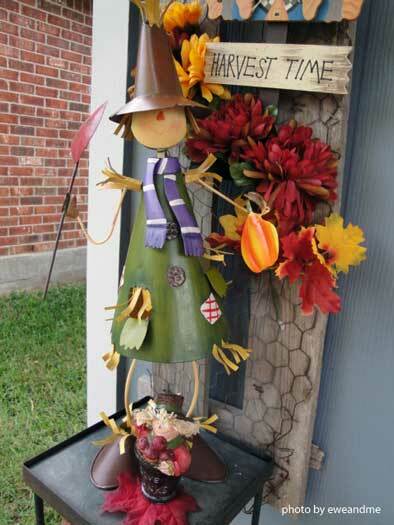 Adding a bit of whimsy adds charm and color to any front porch and is a neat way to greet your visitors. The bird house planter (above) makes a perfect fall decoration adorned with colorful autumn foliage. Place it, or any similar decoration, strategically on your porch to achieve maximum effect. This would also work well on a small table beside the front door or at the top of porch steps. Simplicity works for porch decorating. Like in the previous photo, the Raggedy Ann Doll along with the tub cart filled with autumn colors, adds a special touch to this porch. Your fall decorations can sometimes easily transition into Christmas. The tub cart could hold a small evergreen tree adorned with lights and Raggedy Ann could be placed between colorful wrapped packages! This decorative planter is ideal any time of year. 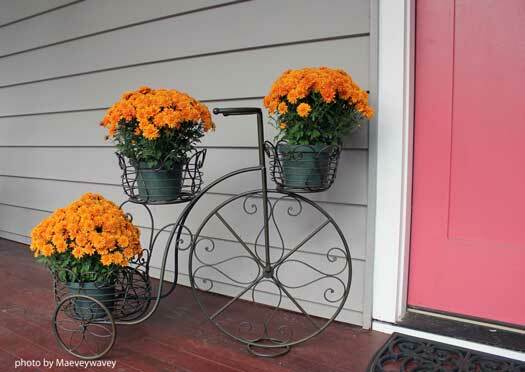 Perfect for these colorful autumn mums, it could just as easily be decorated for any time of year. 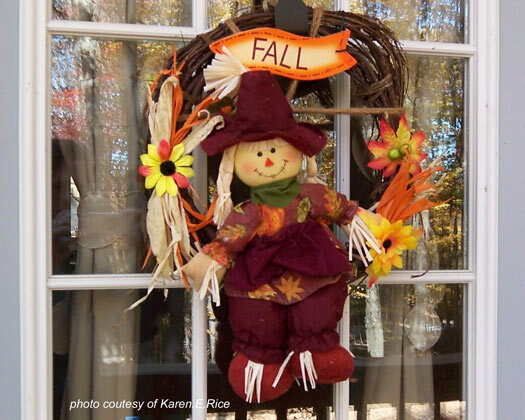 When selecting decorations for your porch and to save money, look for items that can be used for any season. Decorating ideas for fall come in all shapes! 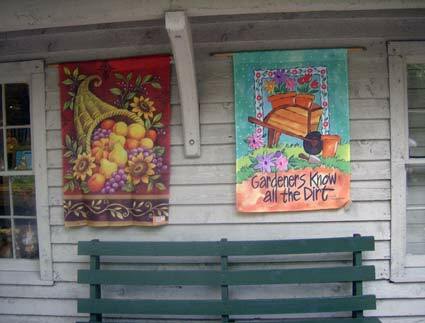 How about a sign on your porch made from materials you collect in the woods? The picture you see here is a sign that says "Thanks" that our daughter-in-love and granddaughter made for us. It could just as easily say "Welcome Friends" or "Happy Autumn!" or your family's last name. We have it hanging in our guest room, but it's an awesome idea for a porch, too! 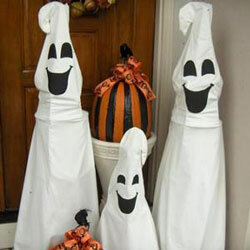 This is a very easy and inexpensive craft that you could do with a friend or child and hang on your porch. Cut card stock in two colors one slightly larger than the other. Or you could also make a more lasting sign of wood instead of card stock. The size depends upon how large you want your letters / words to be. The letters pictured here are 4" wide by 6" tall. Notice that she made the letter "S" a bit larger. You could cut one piece of card stock / wood for each letter or you could cut one long rectangle for your entire sign. If you do the latter, probably best to write out your words so you have a good idea how large to make your rectangle. Mount the smaller card stock on the larger piece. If you are using wood, you might want to paint it a beautiful autumn color in a glossy exterior paint. If you are handy with wood, add some moulding's to make a frame for the wood. That could be painted, too. Take your stash home and lay it out. Pick one natural item to form each letter. You could lightly pencil the shape of your letters on the card stock or wood first so you have a guide to follow. Glue the natural materials onto the card stock / wood with glue that dries clear. Heidi used a glue gun. Hang your completed sign near the front door. Beautiful! 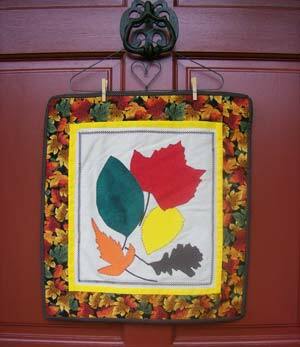 Purchase or make a simple autumn-themed quilt wall hanging. I made the one pictured here. The backing is felt. By definition, it's not actually a quilt because there is no batting inside - although there could be. I found some pretty autumn fabrics and sewed them together to make them the size I wanted the wall hanging to be. Notice that I used a neutral light color in the area that the leaves are placed. They show up better that way. I ironed fusible material to the back of some scraps of fabric in autumn colors. Then I cut out leaves for this wall hanging and then simply ironed them on. I used a piece of felt to make the back of the wall hanging. So easy to do. Don't make it hard. 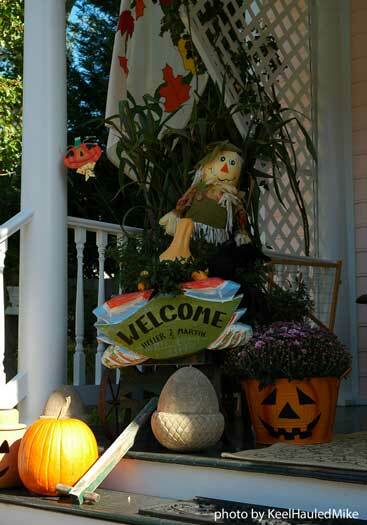 One of the easiest ways to add autumn flair to your porch is by hanging flags and banners with an autumn theme. We found the ones pictured here at a recent trip to Dollywood in Pigeon Forge, TN. 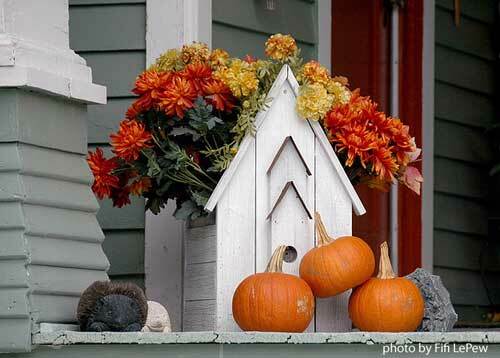 Do you have some decorating ideas for fall to share you would like to share with us? We'd love to hear from you and post them on our site for all to see! 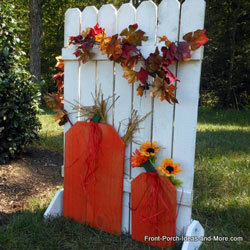 Have fun making this neat outdoor fall decorating idea - we show you how!